This exhibition showcases the work of students who attend Carole’s classes at Ticknall in Derbyshire. 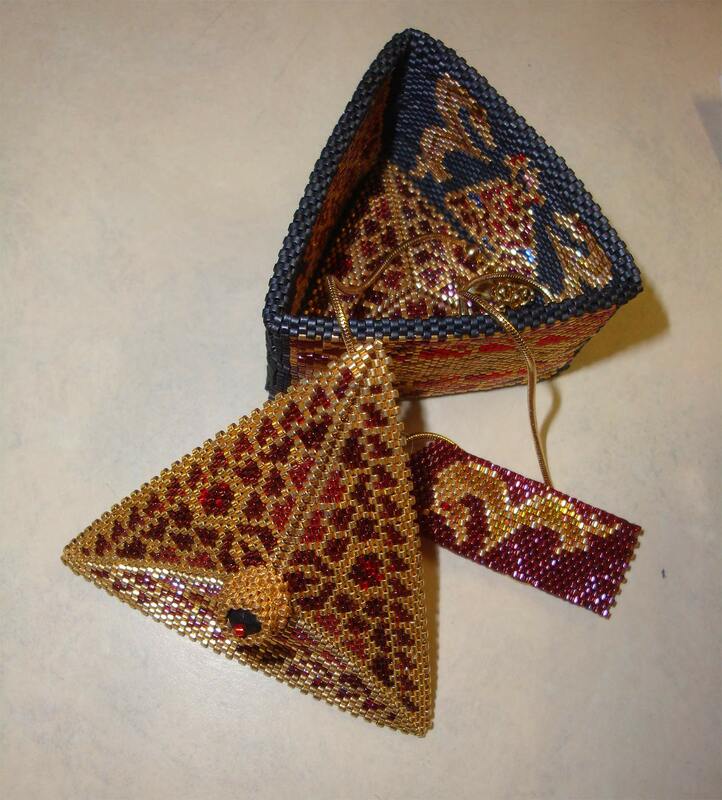 The eclectic mix demonstrates their skills and expertise in Goldwork and other hand embroidery techniques. 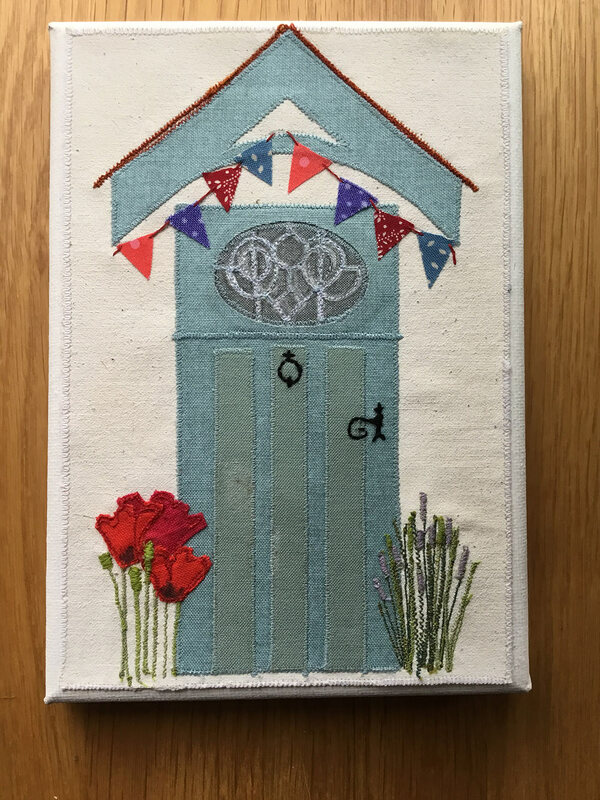 Trained at the Royal School of Needlework, Carole’s aim is to inspire and promote hand embroidery techniques through teaching, demonstrating and exhibiting. 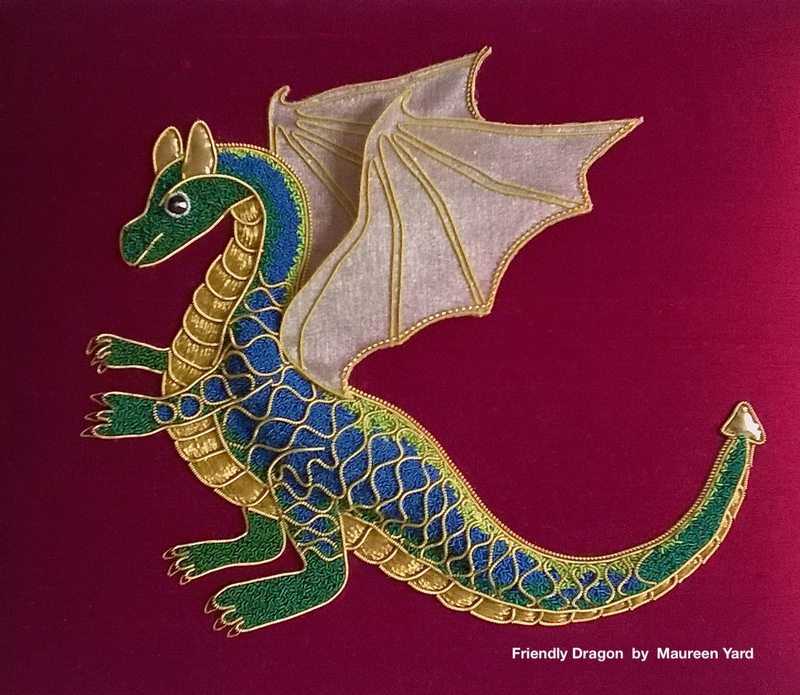 Carole’s contribution to teaching hand embroidery was recognised when she received a Commendation from the Beryl Dean Award for Teaching Excellence. Cinnabar have been inspired by the unique hedgebanks of Devon to produce a new and exciting body of work for the Quilt and Stitch Show. 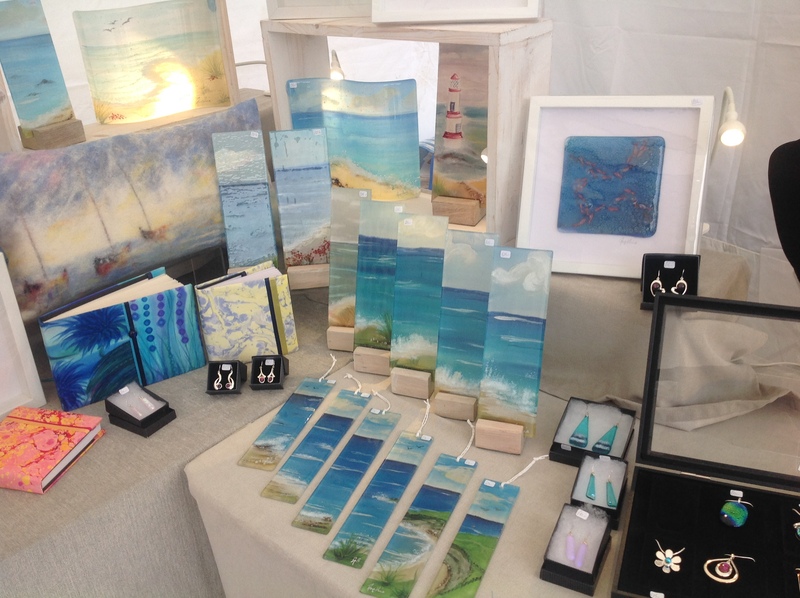 Crazy Mary Crafts (aka tutor Mary Halbert) aims to inspire and enable people to develop their creative potential through workshops, school visits, craft fairs and local community-based projects. 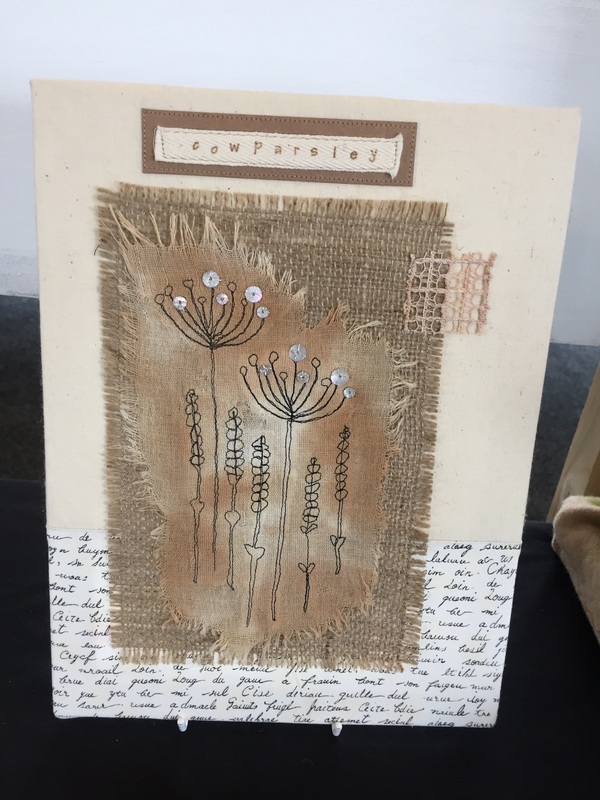 Mary provides classes, talks and demonstrations for groups and guilds (including residential stitching retreats), plus popular textile art projects in schools. Adults and children alike are encouraged to explore their own creativity in a relaxed and sociable atmosphere and to learn new skills with a definite ‘fun’ element. All Crazy Mary ‘students’, whatever their age, skill level or background, should go home with a smile on their face and a new talent to share. 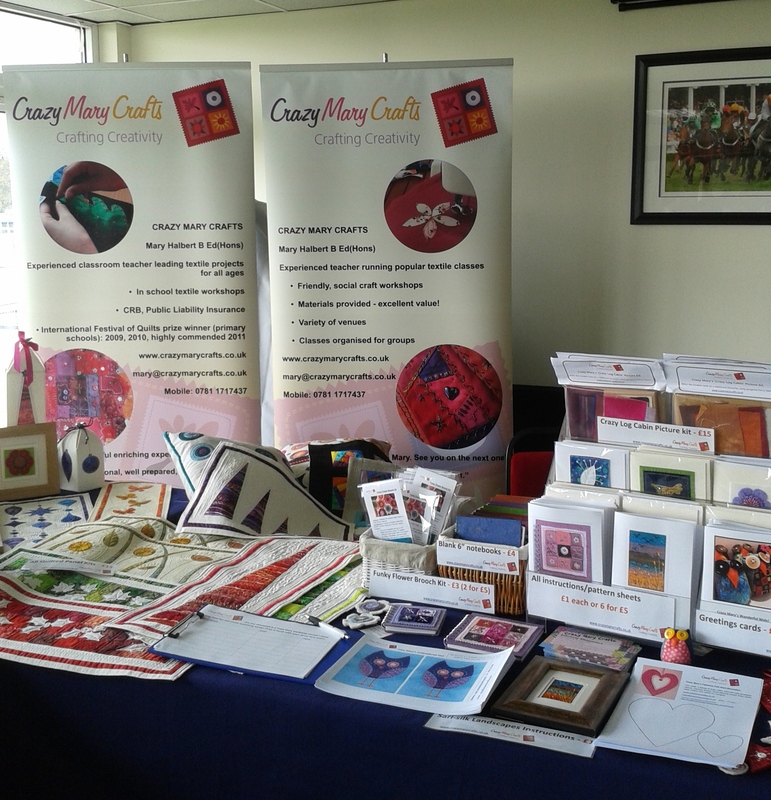 Many of Crazy Mary’s workshop projects are also available to purchase as kits at her stall here at the show. individuals with our own style but bound by a love of fabric and stitch. We are interested in design, new techniques and new ideas as well as the traditions in textiles from around the world. Many of us travel quite widely and this enables us to tap into the richness of different cultures and the wonderful variety of the visual world. We use fabric and stitch to express a personal response to respective experiences, leading to the diversity of the work developed. 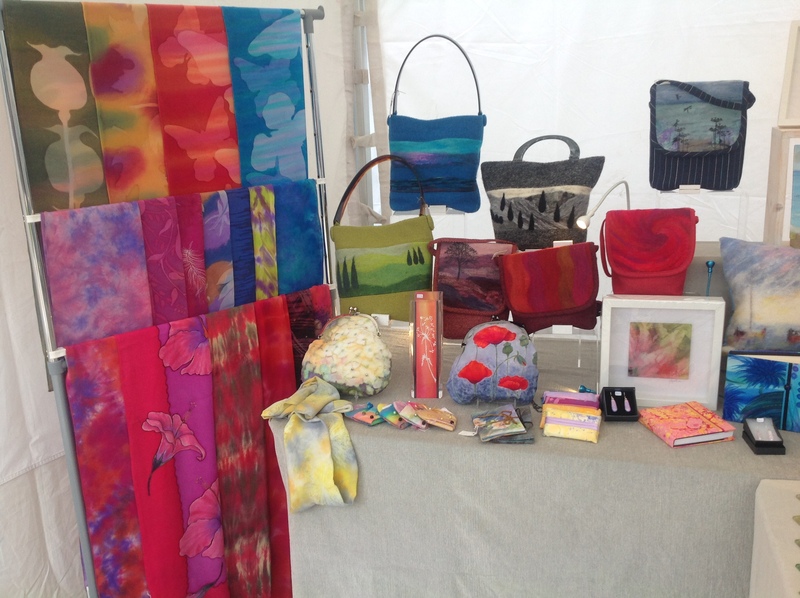 The Embroiderers’ Guild exists to build awareness of stitch and textile art. We educate, encourage, inspire, and promote the achievement of excellence. This is a continuing journey. You may enter at any point. We hope to show you that even though we are called a “Guild” there is nothing stuffy or exclusive about us! 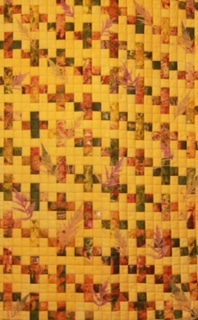 We welcome beginners and those who already stitch or are interested in textiles and textile art. The Guild of Silk Painters is a non-profit organisation whose aim is to encourage and promote the art and craft of silk painting for all. Come and visit our stand and have a go for yourself. 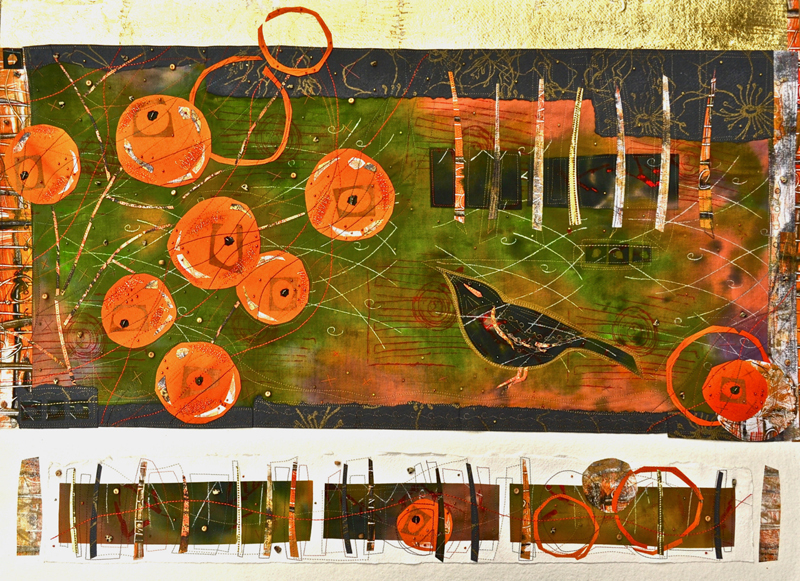 We are a group of friends who all have an interest in textiles and mixed media. Our aim as a group is to produce work in many genres, but mainly to enjoy ourselves. We have a real mixture of talents and skills which is aided by guest tutors and knowledge from external workshops such as Living Threads. 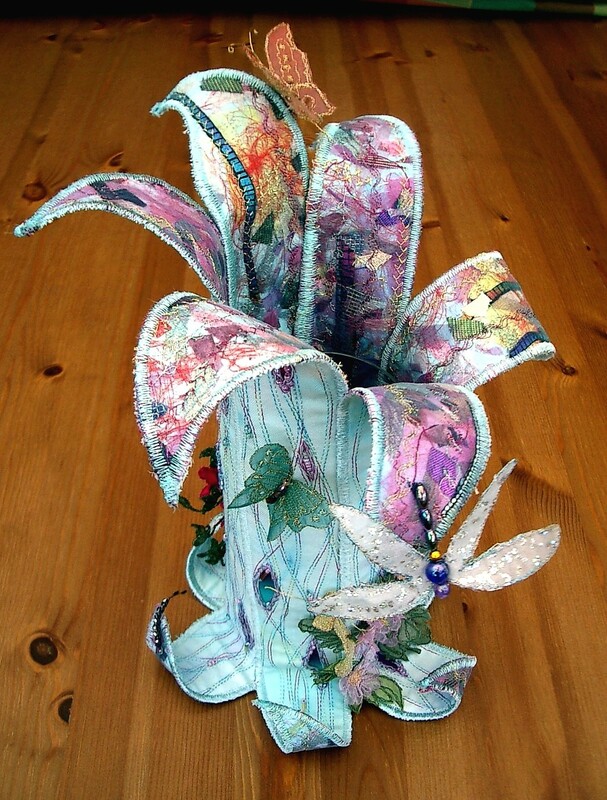 Our work includes machine and hand embroidery, a lot of mixed media, felting. knitting and beading. 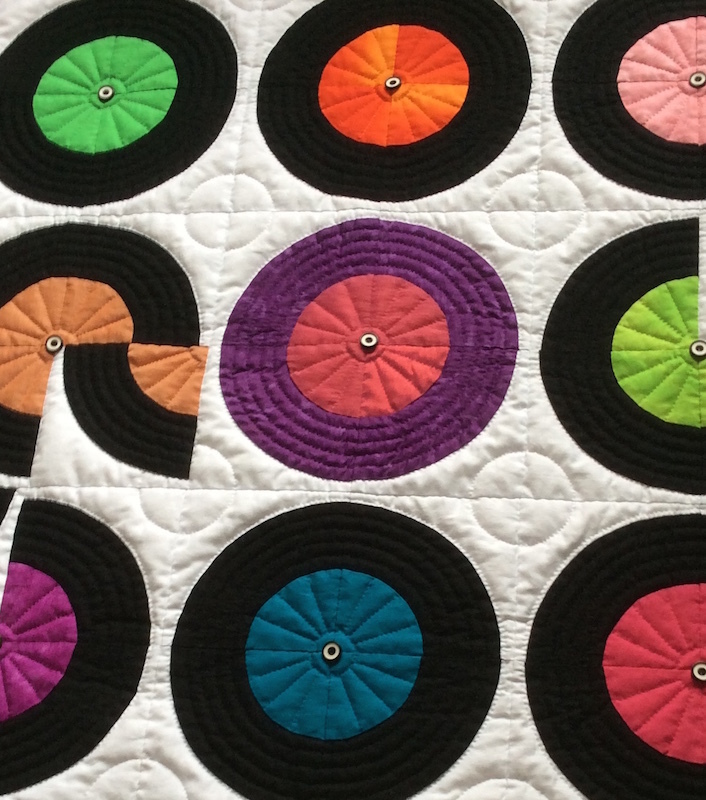 In that mix, there will be a small amount of quilting. 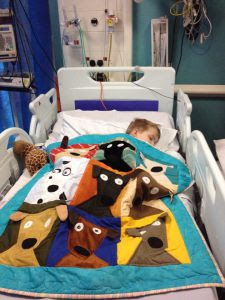 Each year we have a project where members produce an item from a pack of identical materials on a given theme. The only rule is that a piece of everything in the pack must be used. Over the years our themes have been Stately Homes, Autumn, Happy Moments, Communication, Landscapes and Films. This year our theme is ‘The Four Seasons’ and we would like to exhibit this work alongside one of the packs. This work will not be completed until the end of March so I am unable to show you that or even tell you what sort of work will be included. 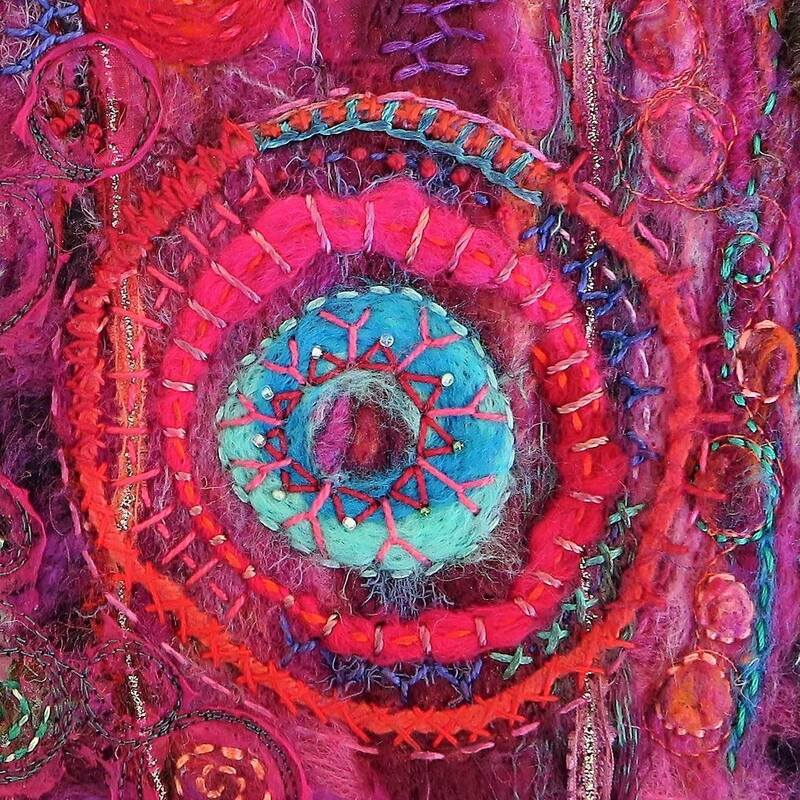 Out Of The Fold is a group of 12 textile artists based in East Anglia. We have all got textile based qualifications and enjoy meeting to share ideas and workshops. 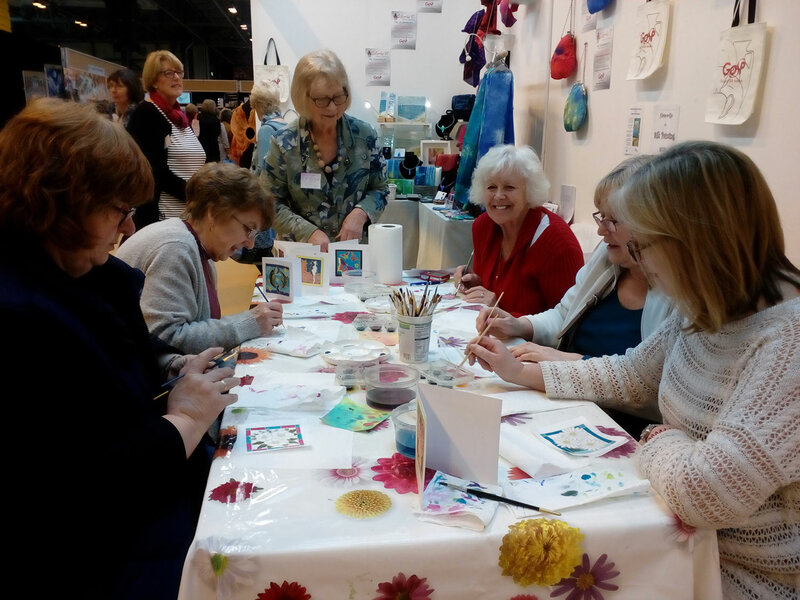 As a group we have exhibited locally, at the Knitting and Stitching Show and Australia. Our new exhibition of work for 2018 is called Out Of The East and we are delighted to be exhibiting at Uttoxeter this year. Traverse is a group of textile and mixed media artists, who came together in March 2017, after studying Experimental Textiles. We begin exhibiting in 2018. The name ‘Traverse’ grew out of a sense of looking or moving sideways, to find different perspectives as we approach a theme for our work – we may not all travel in the same direction to get there, or use the same vehicle. 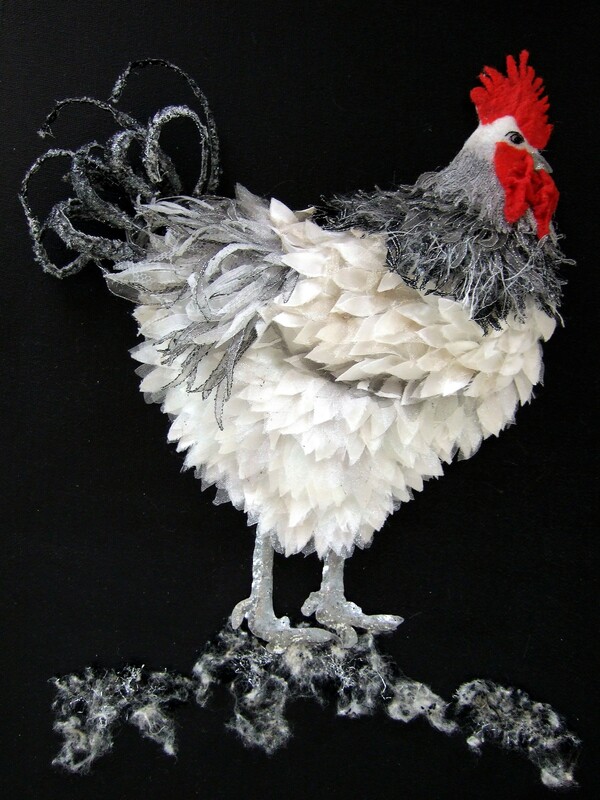 Indeed, although our work is loosely described as mixed media, we each have our favourites, including working with paper, metal, hand-dyed fabric, felt, 3D and fashion, using heat, print, paint, and stitch. A large part of our ethos is to celebrate our diversity, to share our various strengths and to grow together. 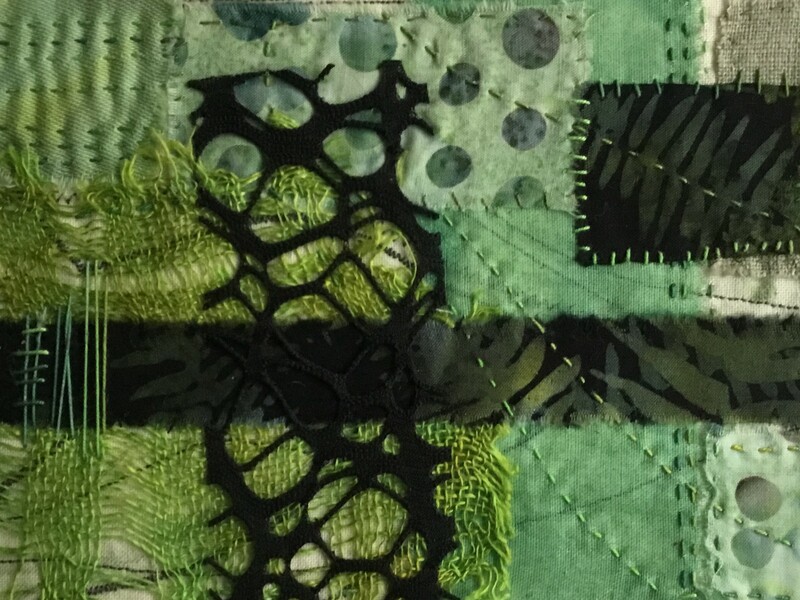 The title of our first exhibition is ‘Destinations’ and our textile and mixed media work reveals different perspectives on that theme – some based on maps, views of the Earth from Space and real and imaginary landscapes. The Latin origins of the word, destinare, ‘make firm, establish’, led to it meaning ‘being destined for a place’ and we hope that this, our first exhibition, will begin to establish our place in the world of textile art. As a group, we decided to set ourselves a challenge for our show in 2017 and we called it “Moving towards Modern” – to make a small modern quilt, approximately one metre square. 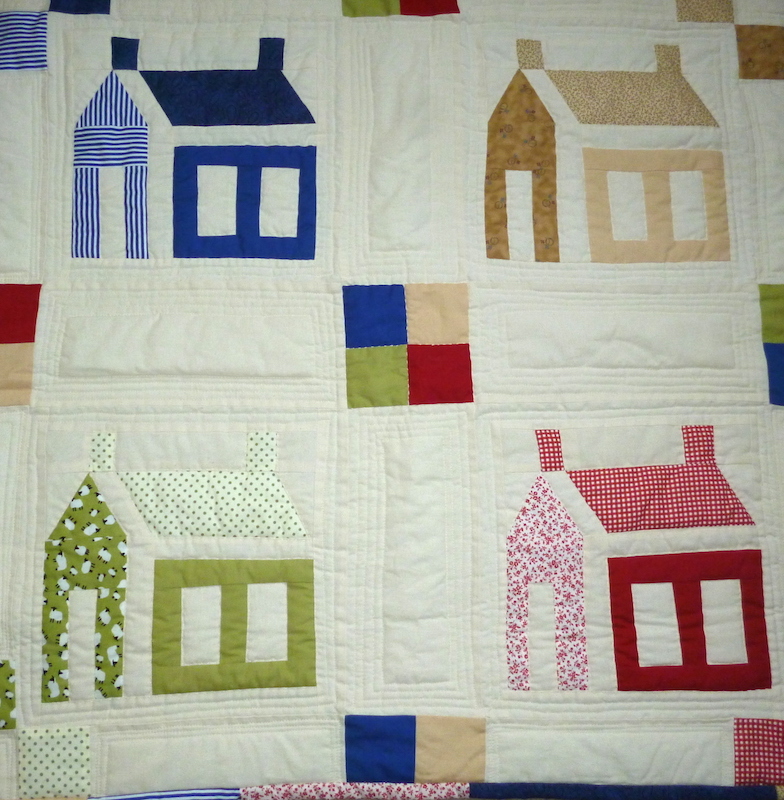 We looked at a range of Modern quilts made by members of Wombourne Quilters, the techniques and ideas used, as well as plenty of images in magazines, books and online. 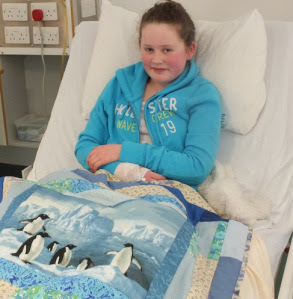 This was followed by a very lively discussion on the definition of Modern Quilt, what it meant and were we all modern quilters anyway – we are making our quilts in the present, using the latest fabrics, colours and current trends. While some found it fun and exciting, others found it more challenging to make the move towards modern but every finished piece proved most successful.